Media Pharmaceutica Indonesiana (formerly Artocarpus Media Pharmaceutica Indonesiana, ISSN: 1411-8734), abbreviated MPI, is a biannual (June, December), open access, online and peer-reviewed journal. The journal was established in 2001 and online version was begun since 2016. Media Pharmaceutica Indonesiana is a journal focusing on pharmaceutical aspects. MPI is dedicated to update and support the development of information and knowledge on pharmaceutical fields. This journal is published twice a year (June and December). 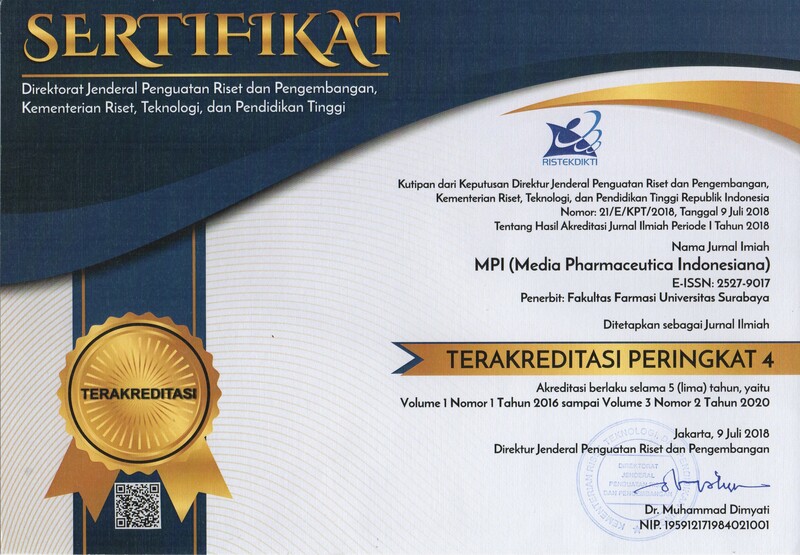 Media Pharmaceutica Indonesiana publishes papers (in Bahasa Indonesia and English) reporting the results of original research, short communications and critical reviews on all pharmaceutical fields. It covers a wide range of pharmaceutical biology, pharmaceutical chemistry, pharmaceutics, pharmacology and toxicology, community and clinical pharmacy, pharmaceutical microbiology as well as other researches related to the pharmaceutical issues.